As they say in television “And now for something completely different”. While still a pure Thoroughbred, The Tetrarch became one of the most memorable horses to be ever bred. His coat colour elicited derogatory comments upon his first race course appearance at Newmarket, April 17, 1913. His grey coat was speckled black and white with small hints of lime green and red in certain light conditions. This gave him the look of a child’s rocking horse in many opinions. The Tetrarch proceeded to silence the paddock derision when he won his first race, a maiden plate, by four lengths with ridiculous ease over twenty-two rivals. The legendary Steve Donoghue his jockey that day, stated that The Tetrarch never did more than canter. From that moment on he was no longer the rocking horse but was now nicknamed “The Spotted Wonder”. The Tetrarch was bred in Ireland by Edward Kennedy at his Straffan Stud, County Kildare, in 1911. He was by Kennedy’s own stallion Roi Herode. His dam was Vahren by Bona Vista. Roi Herode was a French bred grey son of Le Samaritan, also a grey, who was in turn sired by the grey Le Sancy. The latter was one of the dominant sires in France at that time. This represents the Byerley Turk/Herod sire line through the Castrel branch. Vahren was a runner of undistinguished results. She was sired by 2000 Guineas winner Bona Vista, who sired the influential sire of fine broodmares Cyllene. The Tetrarch also had two crosses of Doncaster in his fourth generation. His colouring aside, The Tetrarch was a physically strong looking individual, if somewhat gangling. He possessed long straight hind legs which gave him powerful leverage in his fluid motion. Kennedy was advised to geld him because of his size and forceful temperament. He refused to do so since he owned both the sire and dam and wanted to promote both. The Tetrarch also had a slight dip in his back, which became more pronounced as he aged. Kennedy sold The Tetrarch as a yearling to Major Dermot McCalmont acting on the advice of trainer Atty Persse. Persse not only trained his sire but had seen the young colt dominate other colts in the paddocks at Kennedy’s farm. Due to his imposing size, Persse gave The Tetrarch time to come to hand. Known as a very fine trainer of two year olds, Persse was not expecting much from his young charge. That was until he saw him run in his first initial work at Chattis Hills Stables, Stockbridge. Although still green, The Tetrarch flew by the entire group with ease. This group he beat was far ahead in training at the time, but they were left in the wake of this very fast young colt. This work prompted Persse to début The Tetrarch at Newmarket later that month. The Tetrarch would go on to win all of his races at two. He won the Woodcote Stakes at Epsom on June 3, then the Coventry Stakes at Royal Ascot two weeks later with absolute ease. His next race on July 19 at Sandown became another addition in the extraordinary legend of The Tetrarch. Eight other two year olds were ready to challenge the “Spotted Wonder” in the National Breeder’s Produce Stakes. In a time before the advent of starting gates, a tape or rope was raised to signal the off was used. The Tetrarch decided to “have an argument with the tape” and got left behind by the other runners. Once jockey Donoghue was able to get his partner’s mind back to racing, The Tetrarch was some six or seven lengths arrears. The Tetrarch then flew at the pack to win by half a length in the five furlong race. The Tetrarch beat his chief rival for top two year old honours Stornoway in the Champagne Stakes by three lengths, thus finishing his juvenile campaign undefeated. He was then put away for the season to get ready for the challenges to come as a three year old. Unfortunately, The Tetrarch did not race again. He had a tendency to strike his oft fore leg with his hind leg and this caused dire pain and swelling. The first time this occurred was in October of his two year old season. He came up lame from this and had to be taken out of training while he healed. Repeated attempts to get him back to the races at three ended in disappointment as he continued to re-injure himself. One possible reason for this it was determined was due to his long back legs. The same legs gave him his powerful leverage, also caused him to clip his front legs during running. Retired to stud at Thomastown Stud in County Kilkenny as a four year old, the next chapters of his legend were to be written. The Tetrarch entered stud with a fee of three hundred guineas. This was quite a large sum for a stallion that did not have a chance to prove himself in classic races. He had a very low libido for a stallion and his first three crops yielded fifteen, eighteen, and twenty-two foals respectively. Then for reasons unknown, his fertility rate dipped sharply and his foal crop size was only seven in 1919. He had been bred to forty-two mares for the season but thirty-two did not come to foal, while three were lost to other problems. 1920 brought an upswing in numbers to twenty-three but started to dip again the following year. Sixteen, down to twelve and then to ten foals born in 1923 were his next three crop counts. The downward spiral became worse in the following three years, with only four foals in 1924 then two and finally only one foal born in 1926. In spite of his small foal crop output, The Tetrarch became the British/Irish leading sire in 1919. What he lacked in quantity he made up for with quality. His daughter Snow Maiden won the Irish Oaks that year. His son Tetratema was the leading two year old in 1919. Tetratema would go on to win the 2000 Guineas and the King George Stakes twice. Following his splendid race career Tetratema became The Tetrarch’s best and most influential son at stud. Tetratema sired Myrobella (July Cup and dam of Big Game), Royal Minstrel (St. James Palace and Eclipse Stakes), Mr. Jinks (2000 Guineas and St. James Palace Stakes), and Fourth Hand (2000 Guineas). Tetratema’s daughter Una became the dam of major stakes winner and sire Palestine. Tetratema led the sire list in 1929. The Tetrarch also sired Salmon Trout, Caligula and Polemarch. Each of these three became winners of the classic St. Leger Stakes in their respective three year old season. The St. Leger is the longest distance race of the Triple Crown in England. These accomplishments went a long way to dispel breeder’s concerns toward The Tetrarch’s progeny pertaining to distance ability. Mumtaz Mahal would become The Tetrarch’s greatest gift to Thoroughbred bloodlines. Not only was she his best runner, but Mumtaz Mahal later became one of the greatest broodmares in history. She was bred by Lady Sykes at her Sledemere Farm in Driffield, Yorkshire in 1921. The dam of Mumtaz Mahal was Lady Josephine by Sundridge. Mumty’s pedigree shows ten time stakes winner Speculum three times in her fifth generation. She was purchased by the Aga Kahn III as a yearling. Known as the “Flying Filly”, Mumtaz Mahal was the star two year old of her generation. She did not win all of her races at two however as she lost the Imperial Produce Stakes in heavy going. She was second though. As a three year old, Mumty could not carry her incredible speed to classic distances. Her trainer Richard Dawson would revert to entering her in sprints where she was utterly dominant. Mumtaz Mahal was retired to the Aga Kahn’s Sheshoon Stud at the Curragh, County Kildare Ireland. Here she became one of the Aga Kahn’s foundation mares to his burgeoning racing empire. Among her numerous tail female line descendants of note are Mahmoud, Nasrullah, Royal Charger, Abernant, Petite Etoile, Shergar and the great broodmare Eight Carat. A litany of outstanding racers, stallions and broodmares along her line. Through Mumtaz Mahal and Tetratema, the influence of The Tetrarch in future pedigrees is quite astonishing. Line breeding to The Tetrarch has also been very successful. Sharmeen, the dam of Shergar, classic winning top sire Kalamoun and Queen Elizabeth’s excellent 1000 Guineas winner Pall Mall were fine examples of line breeding to The Spotted Wonder. The Tetrarch has left a very colourful and unusual legacy. Brilliant but not fully tested as a racer, a small but very productive record as a sire with an eccentric but entertaining personality and appearance. The Tetrarch has been able to pass on his incredible speed and also in many cases his grey colour, although not quite as bizarre, to many of his descendants. 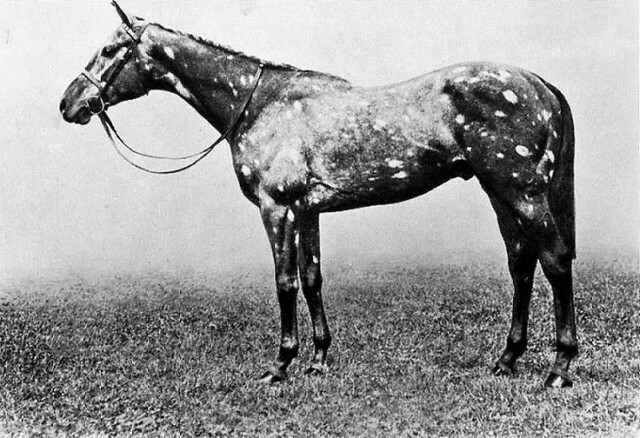 When historians talk of “The Spotted Wonder” they can’t help but smile about the horse that changed laughter to cheers and caused many to scratch their heads in wonder. The Tetrarch is one of my favourite horses in history. I try to be some what an Historian on The Thoroughbred Race Horse I follow it and them the very best I possibly can and love it all and I thank ya’ll. I always like to know what became of a great horse in his old age The Tetrarch died at Ballylinch Stud in1935 he was 24 yrs he us buried there. Can you imagine the impact he would have made had he been more fertile.Amazing how much his influence has been with such a small foal crop. I will pass this on to my Dad, he will be very interested in reading it , his Grandfather was Edward Kennedy. Thank you for another wonderful article. What a character The Tetrach must have been. I have never found a site as wonderful as this with so much info. Mr Nolte you have a gift and an obvious love of horses that comes through with every article you write.